Successfully Added Car GPS Navigation DVD Player w/ Bluetooth (7 Inch Touchscreen) to your Shopping Cart. Car GPS navigation DVD player with impressive 7-inch LCD touchscreen in 2-DIN (100 mm) form with Bluetooth handsfree calling functions. This double DIN multimedia system works well as a car GPS navigation system, an entertainment center, and Bluetooth device. Attractive and well-built with a vibrant 7-inch LCD touchscreen, the CVSA-C07 runs the WIN CE 5.0 environment so you can use today's popular GPS navigation software maps. How does it work? You just insert your SD card and get ready to be guided to your destination. Better yet, with a dedicated car GPS navigator you have the advantage of having a 3-meter long magnetic base GPS antenna which you can locate anywhere on your car to help maximize the GPS signal gain, meaning you will get a constant feed of data that would have been missed on portable units. Knowing you can just get into your car and start driving makes life in our modern hectic day just that much easier. Whether you're driving home from a long day or out of the office during the work day, your family or co-workers are just a cellphone call away. It takes literally seconds to wirelessly pair up your mobile phone to this Bluetooth device and you'll be able to safely concentrate on the road as well as discuss the work report due Monday with your boss or tell your partner you will be home soon and you would really appreciate it if she/he might cook you up a nice meal. If you're in the mood for some car audio / video or the kids just need some entertainment, the CVSA-C07 car stereo has enough entertainment features to keep everyone happy. Maybe you feel like watching a DVD, listening to 200 watts of rich CD or radio sound (4x50w), playing MP3 files, or watching analog TV - whatever you are in the mood for this baby will deliver. Driving is so much more enjoyable when the soundtrack of your life is playing in the background! 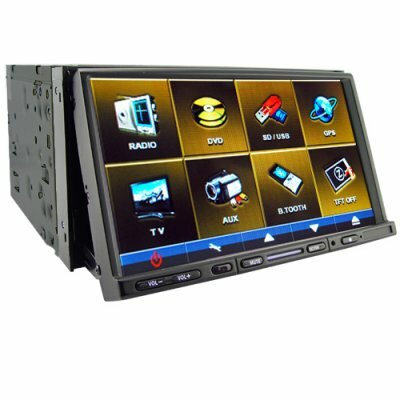 Pushing the boundaries of GPS Navigation and Car DVD innovation, this unit is certain to be a hit with your customers. Whether you are in the resale market, VAR and OEM market, or just need a personal/company use system, this is another amazing product at the usual low Chinavasion wholesale price. Car stereo DVD + entertainment system with large 7-inch swivel screen. Standard double DIN size, 100mm tall. Entertainment, navigation, and communication solution in one unit - for those people who spend a lot of time in the car. Does this unit come with antenna's? This unit comes with a magnetic base GPS antenna. For the analog TV function and AM/FM radio you can use your cars own antenna or buy a seperate antenna (an antenna signal splitter may be needed to feed both the TV and Radio antenna inputs). on 2009-03-14 11:19:34 Looks great ! A pleasure to have in any car. This item would be a good pick to add to my web site.